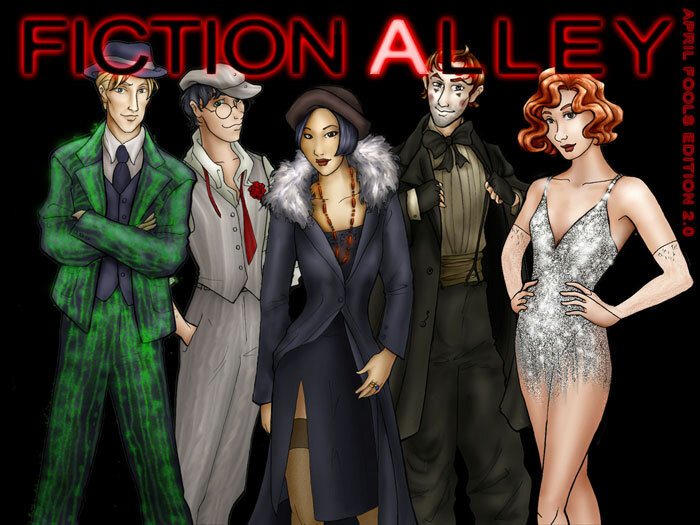 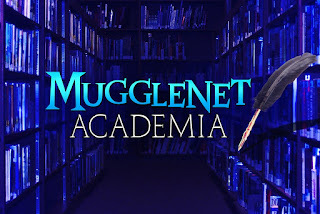 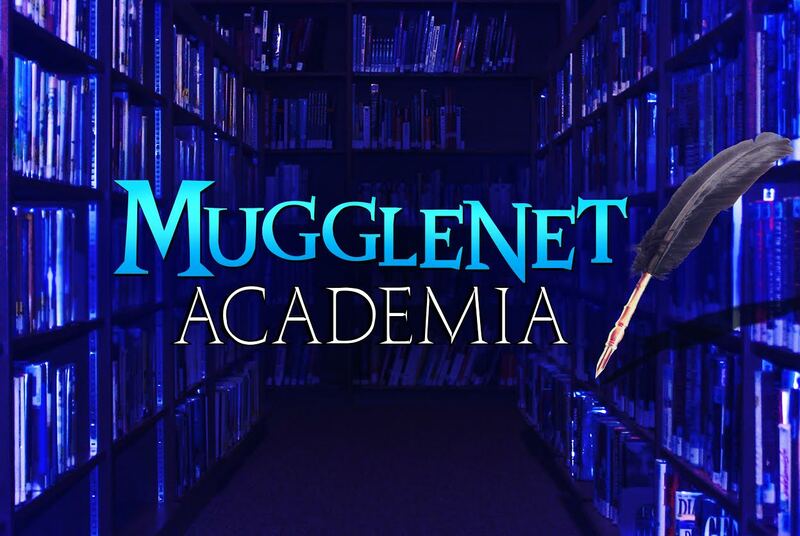 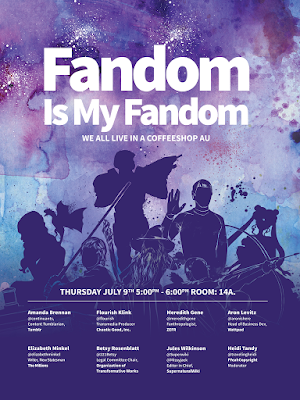 FictionAlley's Heidi will again be hosting the Harry Potter fandom panel - but this year, it's on Thursday night at 8:15 pm in Room 6DE.We'll be making some FictionAlley announcements and discussing all the magic in and around the Harry Potter/Wizarding World fandom (and canon!) with panelists including journalists Elizabeth Minkel (Fansplaining) and Catherine Horvath (MuggleNet), event organizer Chandrika Moka (Wands Up San Diego), sportsters Dawn Biggs (Hogwarts Running Club) and Jessica Ward (US Quidditch), and creative fans like Eliyannah Amirah Yisrael (Hermione Granger & the Quarter Life Crisis), novelist Alexa DeGennaro (Brightly Burning), podcast play producer Mick Ignis (The Great Wizarding War Podcast), podcaster Gary Roby (HarryPotterMinute), playwright Matt Cox (Puffs; Or Seven Increasingly Eventful Years at a Certain School of Magic & Magic). 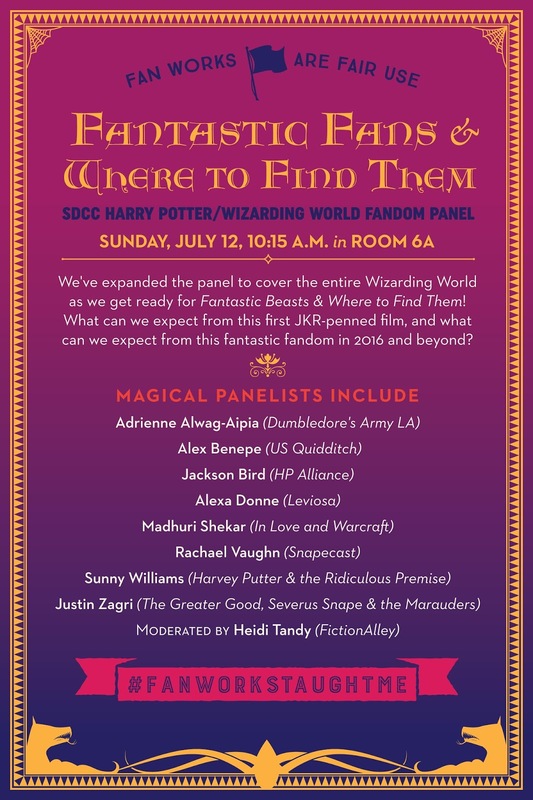 You can also catch some wizarding magic at WB's Cinema Panel in Hall H on Saturday morning -- we expect Fantastic Beasts cast members to be there -- and at Melissa Anelli's panel on 20 years of Harry Potter on the printed page, on Saturday afternoon. We hope to see you there - and make sure you pick up a special badge ribbon and postcard from Heidi if you see her! In July of 2016, fans of Harry Potter & the Wizarding World will get to experience a lot of magic at San Diego's world-famous Comic-Con. 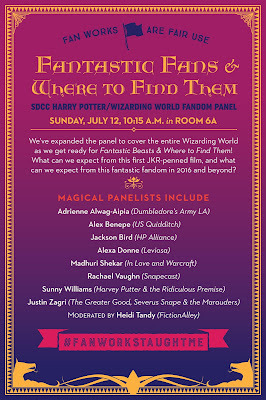 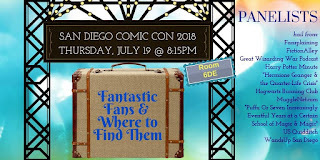 The annual fandom panel will again feature reps from all corners of fandom talking about canon, magic, fandom, and creativity - and include a pre-show with trivia from Dumbledore's Army of Los Angeles. 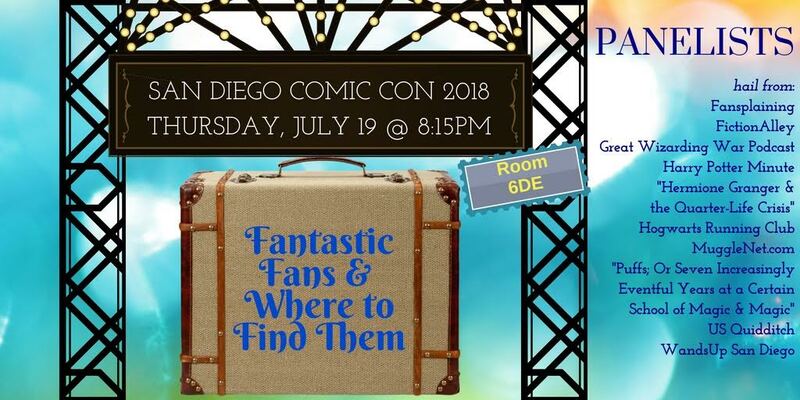 On the Expo Floor, Funko will showcase their new Newt Scamander figure, and many hope Fantastic Beasts will be featured at SDCC in other ways, too! 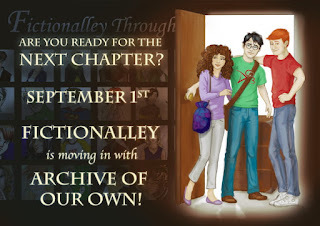 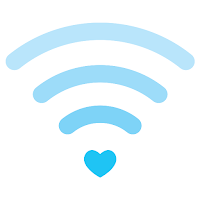 We'll keep you posted! 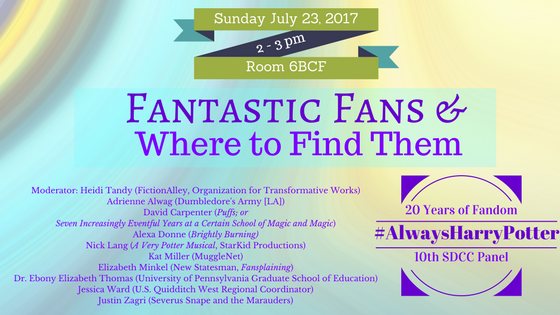 Witches and wizards are heading to Las Vegas from July 7 - 10 for a fantastic fan convention, LEVIOSA! 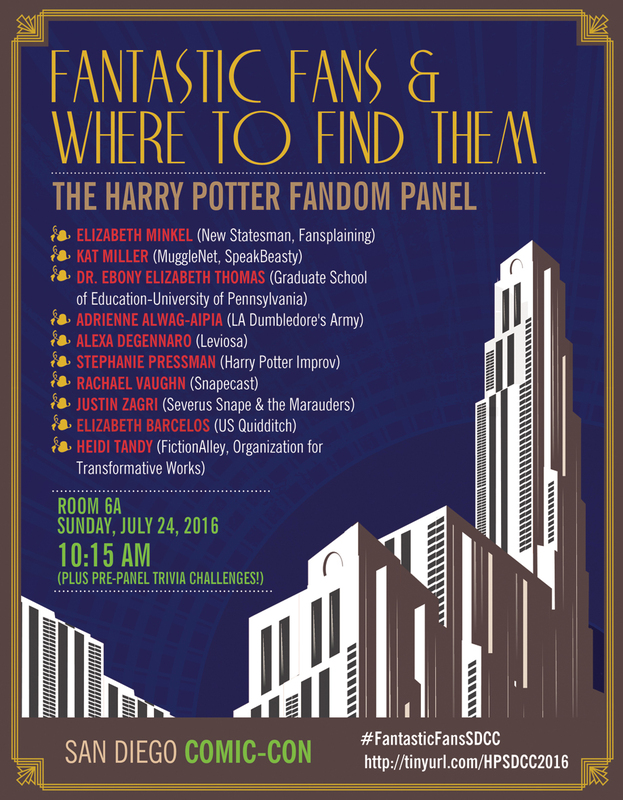 Experience a weekend of Harry Potter & YA Literature amazingness–get panels, workshops, meet-ups, performances, special events like our Magical Ball & more! 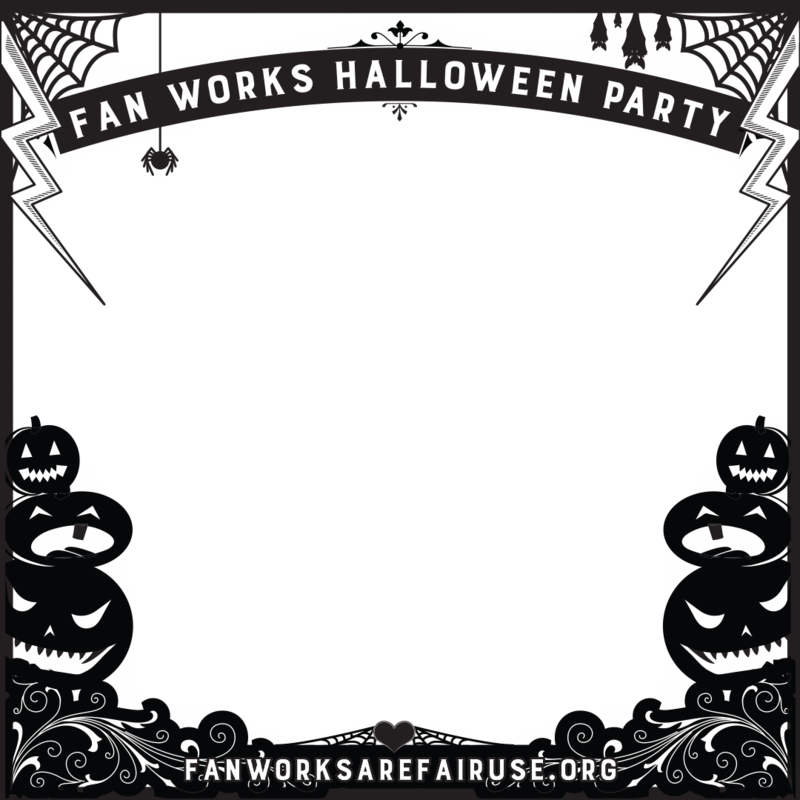 Day passes are still available on their site, and at the event at the Green Valley Ranch Resort & Spa in Henderson, NV. 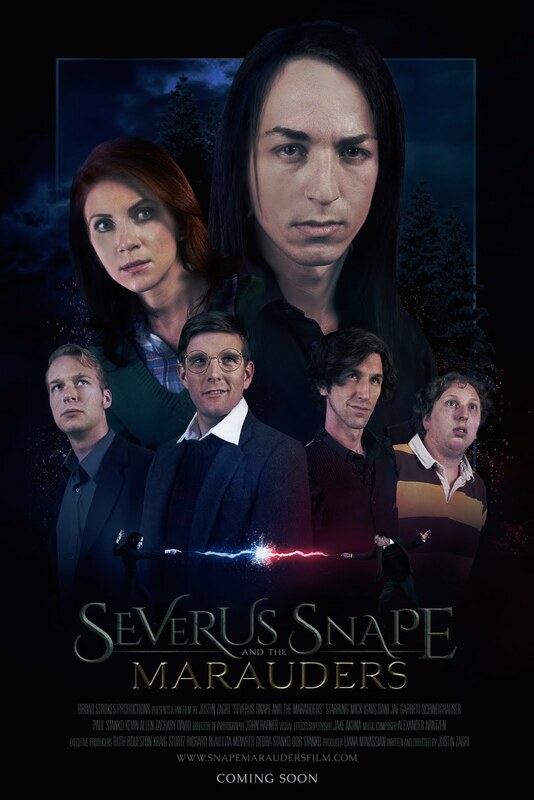 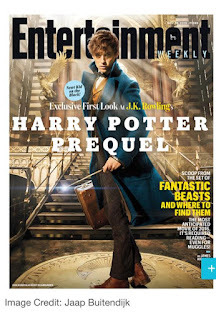 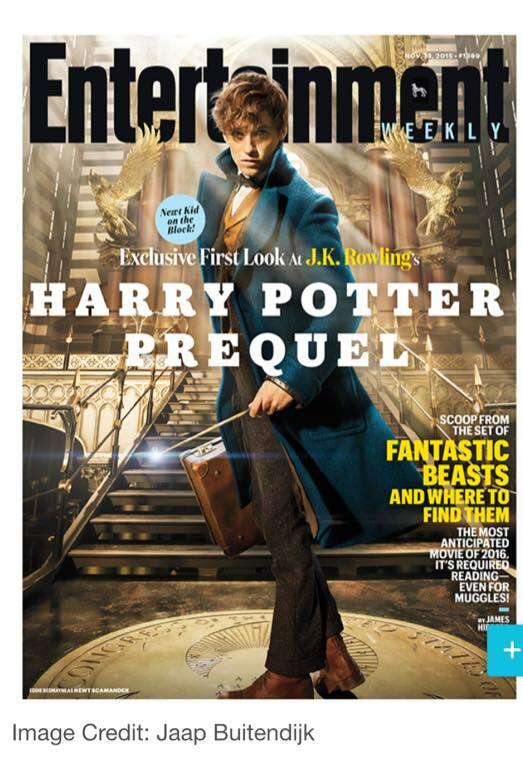 They're coming this month, not just from fans, but from J.K. Rowling herself! 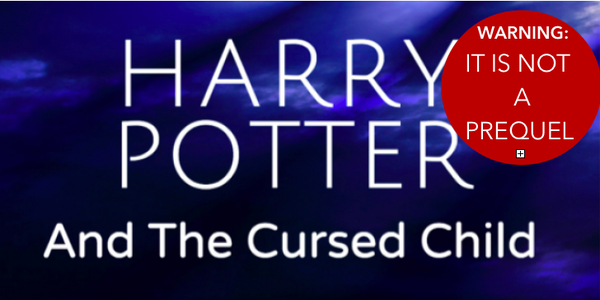 Starting on December 12, JKR will be posting one story a day on Pottermore - and at least one story will be focused on Draco. 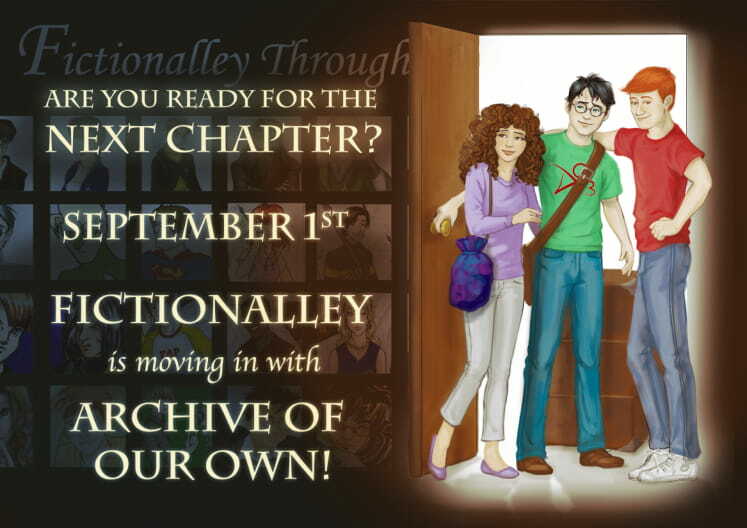 No word yet on who - or what - the other eleven stories are about but at least one FictionAlley staffer is hoping for Regulus Black. 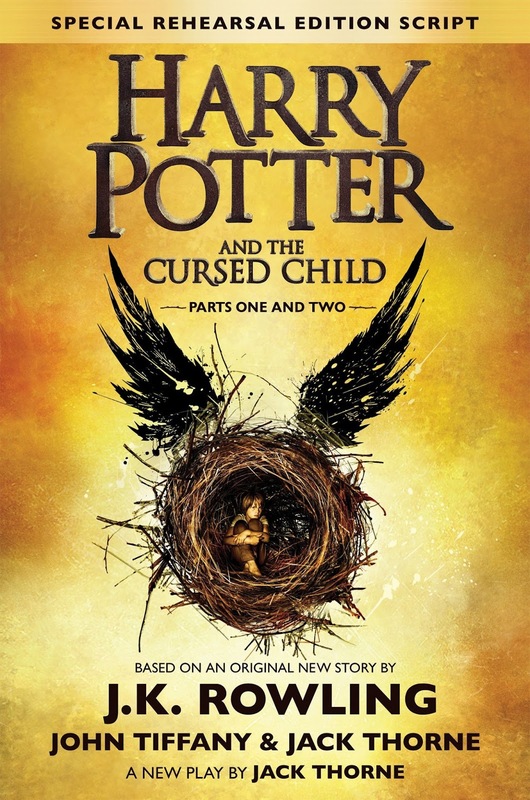 What characters would you like to see in JKR's "ficlets"?